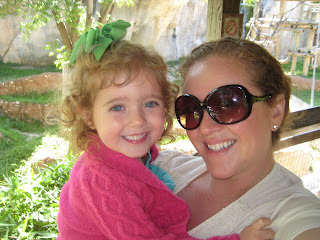 Fun day at the zoo! 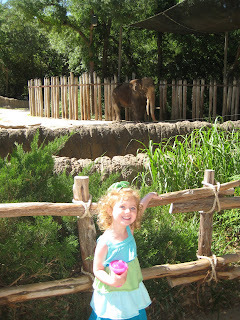 On Saturday morning, bright and early (had to beat the crowds), Ruby and I loaded up and went down the street to the Fort Worth Zoo. 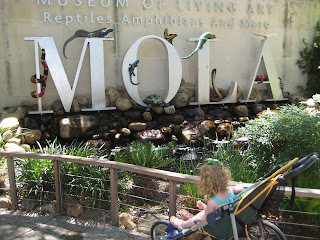 We are so incredibly lucky to have such an amazing zoo close to our neighborhood! 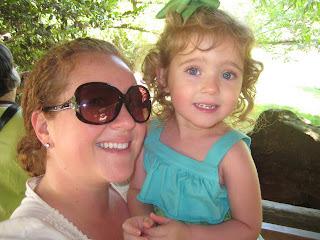 Ruby absolutely adores the zoo and this Saturday was no different. 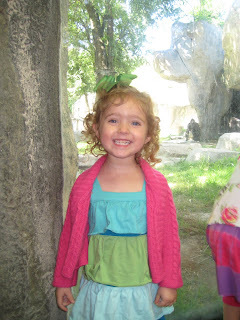 She had a perma-smile on her face the whole day - well, until it was time to say "bye-bye" to the zoo and ooohhh, those tears were real. She's already talking about our next trip, which she had mentally scheduled for today. She was none-too-pleased when she realized that I was off to work instead. It looks like a season pass is a purchase that will be in my immediate future. 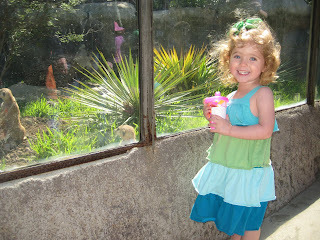 Ruby and the Meerkats. She kept asking where Diego was. Note to self: don't let Ruby watch quite so much tv. 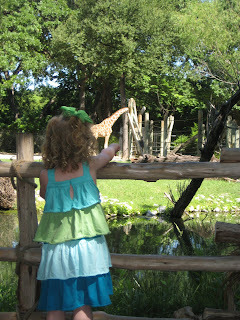 Ruby explaining to me which giraffes were the mama ones and which giraffes were the baby ones. She's quite the subject-matter-expert. 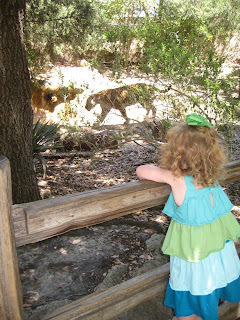 Ruby loved watching the jaguar. She made me take about 10 pictures with her and the jaguar. And she screamed "Mrow Mrow!" at it the entire time. 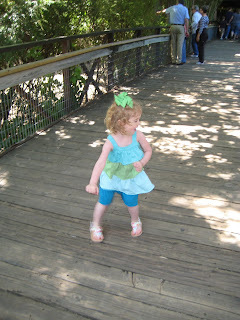 At one point, I believe near the hippos, Ruby was so incredibly excited that she broke out into a spontaneous dance. Ruby was quite impressed with the big "croc-e-dyle". But more impressed with the turtles. 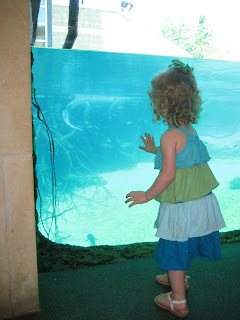 She asked if I would let her get in there to hug the turtles. Nope, sorry kiddo. She makes my heart so happy. I feel like I need to give an apology to pretty much everyone that I know. I've recently realized that I've purposfully been distancing myself from you. Family, friends, coworkers, acquaintances. And I'm not sure why, which is the most frustrating part. I've been keeping people at an arm's length from me. When I feel like someone is getting close, I back further away. I make excuses a lot about why I can't do something or why I can't talk. Other times I rationalize the fact that I rarely return phone calls by thinking "Oh, I have to pay some bills," "I'd really like to listen to this thing on the radio," or "This laundry isn't going to do itself." When I do actually talk to my friends or spend time with them, I try incredibly hard for that to be "quality" time. But I've noticed that I tend to guide the conversations towards relatively neutral topics like what our kids have been up to, how work is going, and if they watched Glee last week because OMGmyDVRhatesme&didn'trecordthewholething. But some of my close friends - the ones who feel like they're the other half of me - notice that I'm pulling away and call me out on it. I get all defensive and inevitably end up asking what their plans are for the upcoming weekend, or something along those lines. Deflection. Even though I feel like I'm running a zillion miles an hour when I'm with Ruby (clean, play, clean, cook, play, clean, diapers, sing, clean, eat, dance, clean, etc.) - that's really the only time that I feel like I'm at peace. When things get quiet - when she's fallen asleep for the night - that's when I start to feel panicky. If you know me, you know that I'm a very scientifically-minded person. Everything can be explained, one way or the other. Which is why this has been bothering me so much. I can not, for the life of me, figure out why I am pulling away and why I feel so unsettled. Maybe it's because if I keep everyone at a safe distance, there's a less likely chance that I'll get hurt. Again. Who knows. It's probably some sort of defense mechanism that would make sense if I had time to read some self-help book about it. But y'all....I'm so excited when I have time to do something like even take a shower, books aren't even on my radar. So, for whatever reason, I'm sorry if I've made you feel like I don't care or I don't want to spend time with you. I do want to spend time with you and I do care. A lot. A friend from college, I literally haven't seen her since then, told me last weekend that she reads my blog because I inspire her. That floored me. I feel so incredibly honored that I've inspired even one person out there to be a better parent. Ruby is my happy-place - the thing that makes me want to be a better person. She is my inspiration. If you have kids in your life, I can only pray that they are your inspiration as well. There's not a whole lot better in the world than banana-and-milk-scented kisses as you're walking out the door to go to work to give you motivation to do what you have to do. I hope that some day she can see me as the role-model that I want to be. I want her to see me as a strong, independent, successful, loving, faithful woman. But I'm scared that I'll teach her to guard her heart too much. I'm scared that she won't be willing to take those necessary risks in life.